Concorso Italiano, the world’s largest and most prestigious exotic and luxury Italian car show, today confirmed the participation of Bacchelli & Villa, a historic automotive restoration house specializing in rare and classic Ferrari, Lamborghini and Maserati models. As part of their participation in the show this year, Bacchelli & Villa will showcase the extremely rare Ferrari 250 SWB (1:1 scale) and 250 GTO (1:3 scale) wireframes used to restore and build these Italian works of art. On the event grounds, its parent company and the largest Ferrari dealer network in the world, Mattioli Automotive Group, is set to display a 1973 Ferrari 365 GTS/4 “Daytona Spider” from Collezione by MAG, their dedicated classic and collector car segment, and an all-new Ferrari Portofino among a current Ferrari lineup. Since its inception, Bacchelli & Villa has completed more than 400 restoration projects, which satisfy the rigorous Ferrari Classiche standards and certifications. Their work includes some of the most significant chassis ever made, including the 275 GTB4 owned by actor Steve McQueen. That vehicle is currently the most expensive Ferrari 275 GTB/4 ever sold at auction. Another is the Ferrari 250 GTO s/n 4675, one of only thirty-six 250 GTOs originally produced and one of a limited few with Series II GTO bodywork that proved itself a tremendously capable racing car, rarely finishing outside the top three in its class and achieving numerous race wins 1961. This one-of-a-kind operation was founded by partners Franco Bacchelli and Roberto Villa in 1972 in Bastiglia (Modena), Italy to maintain and repair sports and racing cars. In 1976, they were approached by Sergio Scaglietti and Gaetano Florini who recognized their work and authorized Bacchelli & Villa as a Ferrari-certified body shop. They are one of the only restoration houses in the world that can produce the same wireframe shaping tools used in the past to produce certain Ferrari models. In the restoration process, these wireframes are used to reproduce a partial or complete portion of certain models with accurate conformity and proportion. Although their core business has concentrated on competition cars, they have also restored numerous significant road cars, including no less than 50 Ferrari 275 GTB/4s and a quarter of the total 250 LM production over the years. Bacchelli & Villa was acquired by famed Concorso Italiano sponsor Mattioli Automotive Group last September. They are known as North America’s premier Ferrari dealership group comprised of Ferrari Beverly Hills, Ferrari Maserati Silicon Valley, Ferrari South Bay and Ferrari Westlake along with the GT-award winning racing Team, Scuderia Corsa. “Our team has partnered with the esteemed Mattioli Automotive Group for many years and we are proud to welcome their newest addition, Bacchelli & Villa,” said Tom McDowell, chairman, Concorso Italiano. For information on Bacchelli & Villa or the Mattioli Automotive Group, please visit: www.bacchellivilla.com or www.mattioliautogroup.com. To check out an informative video, please visit: https://bit.ly/2v2xVh0. 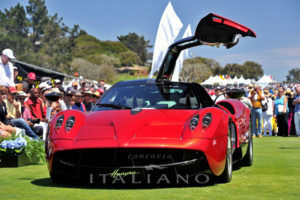 For more information on Concorso Italiano, to purchase tickets or register for media credentials, please visit: https://concorso.com/. Founded in 1972, Bacchelli & Villa is one of the most prestigious and renowned restoration shops in the world. Specializing in Ferrari, Lamborghini, and Maserati, you will find Bacchelli & Villa a few miles drive, through scenic Italian countryside, from the Ferrari Factory. Headed by Marco Arrighi, Bacchelli & Villa welcomes any level of restorations, from the simple repaint of your vintage car to a complete rebuild and restoration of your classic car, to the creation of historic cars masks and specialized tools. Bacchelli & Villa is also specialized in dedicated repainting for engine components of current production models for Ferrari, Lamborghini and Maserati.